Colt Buchanan’s life changes in a matter of minutes when his mother and father are ripped away from him during a surprise dust storm that leaves their Wyoming cabin in nothing but splinters. It’s a moment they’ve prepared for all his life, but at ten years old, he’s not sure what comes next. When he climbs from the cellar, he realizes that this was no ordinary dust storm. The devastation was done by something more powerful…more sinister. Something man-made. But Colt is rescued before any further harm can come to him by Captain Conrad Givens who pilots an amazing invention that flies in the air. Givens takes Colt to the safety of Fort Discovery, a place where Colt learns how important his parents’ scientific work has been—and that he’s not alone. There are many other brilliant children there, as well—children whose parents had extraordinary scientific skills just like Colt’s parents did. And someone is making orphans of them all. When danger threatens Fort Discovery, there’s only one choice Colt can make. He has to do whatever it takes to protect the enlightened community that exists there—teachers, scientists, and students alike. But how can he defeat the formidable enemy, Anvil Smith? 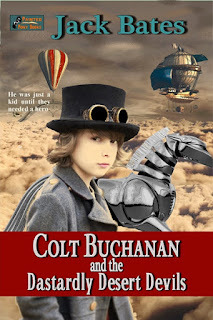 With the help of his friends and Pecos Bill, Colt realizes he’s more than “just a kid”—and saving Fort Discovery is the only way to find out where his parents are! In that same instant, lightning sparked down along the copper shaft of the spyglass. Colt felt all of its power race through his body. The house shook as sand exploded through the walls. Colt covered his eyes with his arm to protect them from the sand. He briefly saw his mother lift off the ground. The next instant, Colt was toppling down into the cellar. Colt looked up at the swirling, sandy world overhead. His father’s hand reached out above him. Colt sprang up reaching for the hand that disappeared as quickly as it appeared. Colt’s world went black as the heavy metal door swung shut. Small traces of dust seeped through the door frame. When the dust settled, both Randall and Jenny Buchanan were gone. And they would remain that way for a very long time. 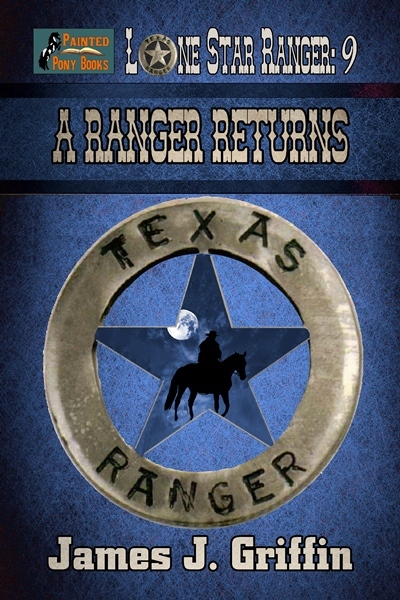 Nate Stewart and his Texas Ranger partners return to Austin from their grueling assignment in west Texas, expecting only a few days’ rest before they are sent back on the outlaw trail. Instead, they learn that the state legislature has refused to extend funding for most of the Rangers. All but a few have been given their walking papers—placed on indefinite furlough. 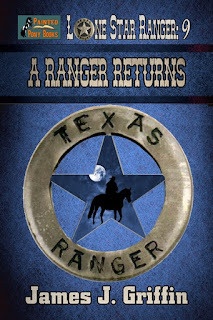 Forced to face an uncertain future without the Rangers, Nate and his best friend and partner, Hoot Harrison, travel to the land Nate still owns outside San Saba. With mixed feelings, the pair heads toward Nate’s family's ranch—now, where Nate’s parents and older brother are buried. But when they reach San Saba, they’re met with guns and force. Someone is attempting to take over all the ranches in the area—including Nate's. Vowing not to lose the land his father had struggled so hard to tame, Nate is determined to unravel the plot—and the people responsible—for the hostility. The trail to the criminals, ironically, takes him back East—to his own home town of Wilmington, Delaware…and someone he’d have never suspected. Nate leaned back against the whitewashed west wall of the Salt Flat Café, where the Rangers had been staying. He was seeking the least bit of shade, since the temperature was already well into the eighties, even at this early hour. He stretched out his legs, and pulled his Stetson over his eyes. Boy howdy, a lot sure has happened to me, includin’ sayin’ stuff like ‘boy howdy’, over the past year, he mused. First, I lost my family, then I gained another one, sort of… my Ranger pards. At least the men who killed my mother and father, and Jonathan, are all dead. Me and my pardners made certain of that. I’ve learned that I don’t hate Texas, like I did when my father first dragged our family here, but love almost everything about it, except maybe the dust. I’ve learned how to care for both myself and my horse, and how to survive as a lawman. I’ve been shot by outlaws, and shot them, been in fistfights…. Nate drifted off. The next thing he heard was Hoot’s voice, as his partner and best friend kicked at the sole of his boot. In 1979 I was 13 years old, and the Space Age was still all around. The launch of America’s new space shuttle was imminent, and my dad and his friends were excited about the coming of home computers and video tape machines. My grandpa’s Aunt Rose shared my enthusiasm. When she was 13—in the same year as Jo Harper—the 20th century was just beginning, and technology was beginning to make serious changes to everyday life in the West. While the German immigrant grown-ups in Nebraska embraced steam powered tractors, then gasoline engines, telephones, electricity and wireless telegraphy, Rose let her imagination soar into the future. When I was 13, I sat at her table sipping instant coffee and listened to her stories. She talked about moving pictures projected onto bed sheet view screens in the back of the old mercantile store. The thrill when she first saw an airplane move through the sky above the Nebraska prairie. The excitement of listening to music in her farm kitchen—music pulled straight out of the air. These stories have stayed with me. And haunted me for the past couple years. I always hoped there would be another story for the series that began with Waiting for a Comet. The first four, gathered together in Finding the Sky, capture Jo’s enthusiasm for the wonders of the nature. The following collection, On Solid Ground, are crime and mystery stories—almost like a young Nancy Drew on the range. The Flight of Lydia Grimm picks up on that enthusiastic sense of life that is so much a part of Jo and leads off a series of four that combines the qualities of the first two. This time, influenced by Aunt Rose, Jo’s engaged with man-made wonders even as she thwarts the crime or solves the mystery. I hope you’ll join Jo, Frog, Abby Drake, and their friends and foes alike as they rush to embrace the future, first in The Flight of Lydia Grimm (now available) and coming soon, Last Wytch Park. Jo Harper and her sidekick, Frog Beemer, are on their way to the movie in small-town Willowby, Wyoming. 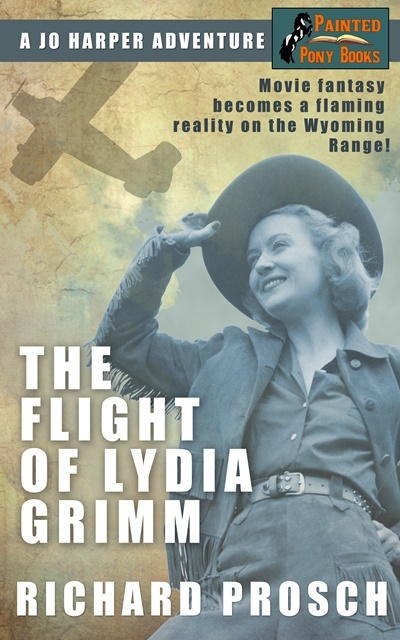 Beautiful Hollywood heroine, high-flying Lydia Grimm, is Jo’s role model—and she’s sat through Lydia’s latest movie, Wings Aflame! countless times. The only thing that can stop Jo and Frog from sitting through it again is the real thing—wings aflame—right over their heads! Fantasy becomes a flaming reality on the Wyoming range as a burning airplane falls from the sky, and Jo and Frog grab their horses and ride to the scene of the disaster to help. But when Frog returns to Willowby for help, Jo is held at gunpoint by the German pilot who has survived the crash! All bets are off when Jo learns that her captor is involved with the very star she idolizes—Lydia Grimm! Lydia’s in danger, but it’s up to Jo to figure out why—and she’s determined to get to the bottom of this deadly mystery. “It is a gas engine, but it’s no car,” said Jo, grinning. It was extremely rare to see an airplane in the clear sky above Willowby, but to see one at night, just after she’d been talking about flying, was an exciting change of pace from a typical weekend night. Jo watched the dimly lit shadow putter along the blue horizon. Jo couldn’t help but think how lucky she was to be growing up in such a time as this, when, after centuries of trying, people flew through the air like birds. And just like that, something that sounded like a loud firecracker went off above them and the airplane motor started to whine. GET THE ENTIRE JO HARPER COLLECTION! Books 1-4 are available in the FINDING THE SKY set, and ON SOLID GROUND contains books 5-8! You will want them all! Sarah wishes with all her heart that she could make beautiful music, but her voice won't carry a tune. Determined to play her songs, Sarah sets out in search of a way to make her dream come true. On her journey, she receives a special gift that will finally make her music real ... but how? Can her friends in the forest help her unlock the secret, or will the music she dreams of stay trapped in her heart forever? Stella Long's mountain path was one of beauty as she walked alone at the age of six, talking with her friends, the creatures of the wild in the Choctaw language. 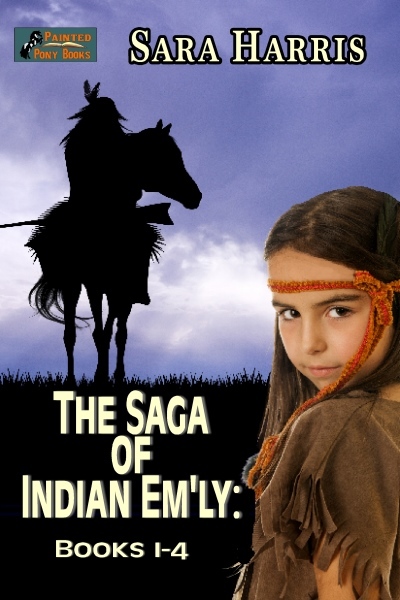 (Fichek is her Choctaw name; Estella is the English name she likes best.) The mountain was her playground. There were times when she'd forget to go home until the night musicians, the insects, began tuning their instruments. 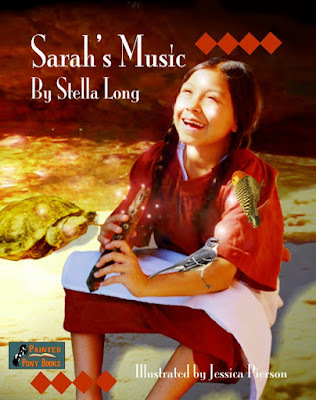 Stella (Fichek) writes and tells children's stories, getting her ideas from the animals and birds as she sits for hours in the solitary quietness of the lakeside observing animal behavior. She weaves a part of her life into these stories combined with Choctaw songs and sounds of the flute. 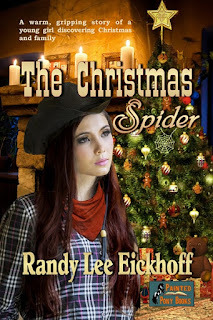 New Release -- THE CHRISTMAS SPIDER by Randy Lee Eickhoff -- Giveaway! Christmas promises to be a bitter time of change for Samantha “Sam” McCaslin following the death of her mother. At thirteen years old, tomboyish Sam tries to fill her mother’s place on the family’s South Dakota ranch, the Bar X. 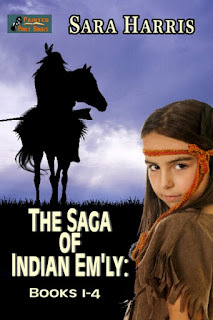 Pressure from her grandparents forces her father to choose between sending Sam to live with them, or seeking a housekeeper to help at the ranch. When Mrs. Six Feathers and her two children, Sarah and Timmy, arrive at the Bar X, Sam deeply resents their coming. She chooses to ignore them as much as possible. But when Sarah and Sam become the victims of Billy Kincaid’s vicious bullying, a bond begins to develop between them as they fight back. I sighed. It was going to be worse than I suspected. Whenever Pa prefaced his words with “we need to talk” I knew to prepare myself. I made an elaborate show of closing my book, staring up at the exposed beams in the ceiling. Pa’s voice had a warning to it, and although I had heard what he said, I knew what he meant. I pulled my feet from between the cushions and swung around, sitting and facing him. “What are you reading?” he asked, although I knew he had seen the title. This was going to be really bad news if he felt he had to wade around in shallow water before jumping in. “Roy Rogers and the Mystery of Howling Mesa,” I said, holding the title so he could see it. It wasn’t a question, but I treated it as such. I shook my head, remembering suddenly what I had overheard the night when Pa and I had stayed over in town. A bad feeling came over me. “Sam,” he began, but I broke in. “Besides, you need me here, Pa. Especially with—” I couldn’t say the words about Mother being gone. The words just wouldn’t come. I continued, fumbling for something to say, rattling on desperately as if I could talk long enough, everything bad would go away. 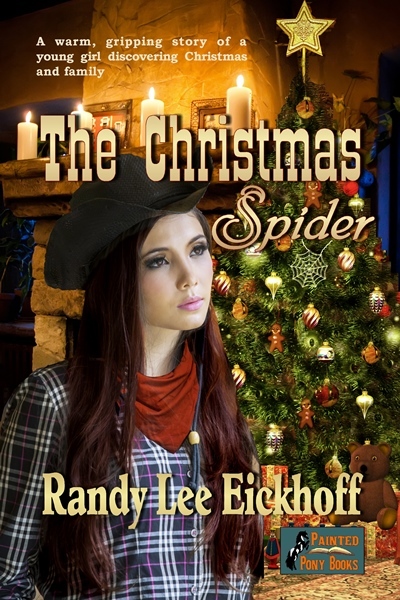 Be sure and leave a comment for a chance to win a free ebook, THE CHRISTMAS SPIDER!